I'm not familiar with that flower at all, but I'd love to have it in my garden! It's what it's called? Dogwood? Haven't seen dogwoods in a really long time. We used to have them back east. Yes, mariposa, this is a dogwood tree. It's our provincial flower here in British Columbia and they've recently started blooming. They're gorgeous! I agree- so pretty. We have bupkis for flowering trees around here. Thanks for the lovely shot! Somebody in another place and time looked at that gorgeous flowering tree and said, "HMMM...what shall we call it? Dog + wood...Dogwood." Such an odd name for such a beautiful plant. I suppose there are worse things to call it - mugwort comes to mind, so maybe the people naming the dogwood did us a favor. Beautiful! 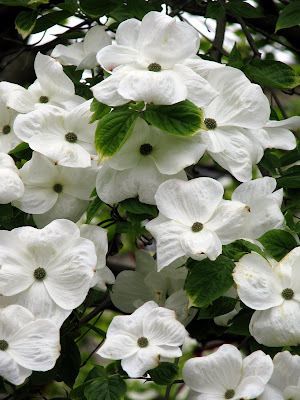 I just love dogwoods, they are unbelievable. Oh, dern it, you had to post dogwood, didn't you?! I'm so jealous because it won't grow where I live. Those are so pretty and possess such perfection! I love dogwoods! Beautiful shot... they look so formal!